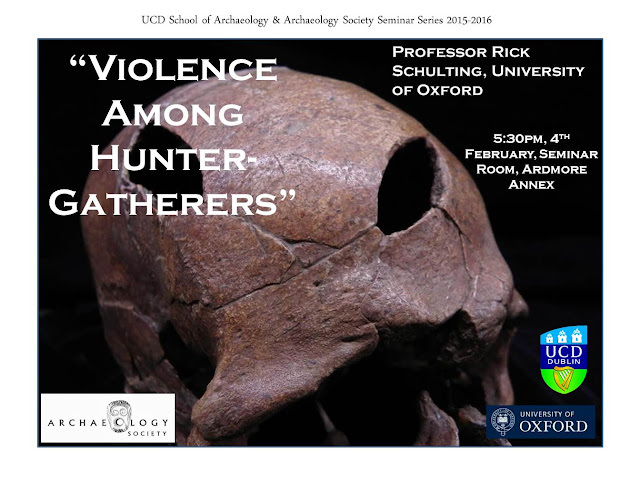 Dr Rick Schulting from the University of Oxford came over on the 4th of February to give us a very interesting seminar. The seminar began with telling us that there is a debate among archaeologists as to the origin of warfare. Were hunter-gatherers engaged with warfare? Is there any evidence of even earlier warfare? When we think about hunter-gatherers, we generally think of much simpler, egalitarian, peaceful groups of people who shared the land as a community. There is evidence of high homicide rates among hunter-gatherers all over the world, but this does not represent warfare, or at least, nothing we can identify as ‘warfare’, in which we envision warriors with armour. However, looking at hunter-gatherers from a different perspective, we can look at the northeast coast of North America, where there were chiefs in charge of groups, slaves who were either captured and brought to the group to serve or born as a slave from other slaves. An example of this was a painting from 1847 of the Songhees war party returning home, holding severed heads as trophies. Several books have been written about violence and warfare among hunter-gatherers, not exactly questioning it, but more compiling information on the evidence for murder, massacres and warfare among these groups. These books include ‘Violence and Warfare Among Hunter-Gatherers’ by Allen, M and Jones T, as well as ‘Warless Societies and the Origin of War’ by Kelly, R. A quote from literature which stands out is ‘thank prehistoric conflict for collaboration, intelligence in humans’. It is a quote like this which makes us realise that once individual groups begin to define themselves and gain a unique identity and understanding of who they are, is when the prospect of warfare begins. Within primitive warfare, size matters – a bigger group of people seem a lot more intimidating than a smaller group. According to a paper published in Science in 2009 by Bowles, S, 14% of adult deaths among hunter-gatherer groups in archaeological and ethnological regions were due to warfare in areas such as Europe, Asia and North America. However, at one site mentioned; Téviec, it is unclear if the violence recorded was due to 3warfare or homicide within the group. At this time in this location, there were no chiefdoms or states, so if someone wronged you, you would have been free to kill them. Also, in this paper there was a lot of data missing, there are at least 30 other sites in Europe which show no signs of warfare, so it seems as though the information was chosen to back up warfare, while all of the evidence showing a lack of warfare was simply ignored. In sites such as Gøngehusvej 7 in Denmark, where a woman with a depression in her skull which showed signs of healing was found, there were no examples of unhealed cranium injuries. Another site in Tilbury, Essex from 6065-5910 BC there were many examples of healed injuries, but no evidence from either site for massacres or battle or warfare. This brought us on to the concept that within hunter-gatherer societies, it is much more likely that there was ritualised conflict not meant to be lethal, such as stick fights which the elders would organise to diffuse conflict between groups in the younger generations. This is backed up by the lack of evidence for perimortem damages within these groups. A few weeks ago, the cover of Nature featured a ‘massacre’ at Lake Turkana. This ‘massacre’ featured individuals with healed injuries, some individuals with their hand bound suggesting some sort of execution, and some perimortem injuries including one individual with an obsidian blade still lodged in the skull. There were 20 individuals spread out over 300 meters, and have a large date range of 10500-9000 BC, suggesting that this was not a massacre, but drawn out over a longer time period. Two sites which Dr Schulting has worked on are Ofnet in Bavaria and Cis-Baikall in Siberia. In Ofnet, two skull nests were excavated by Schmidt in 1909, and when radiocarbon dating came into use, they were dated to the 7th millennium BC, making them Mesolithic, which had previously been debated. There were 28 skulls in the large nest and 6 in the small nest, with a range from infants to adults and males to females. There were a lot of cranium injuries present with about 75% of them having severe cranium injuries. There are two theories that are debated with this site – is this evidence of a massacre or were the skulls placed here over time? The radiocarbon dates received from the nests allow both theories to be possible – they could have all been deposited at the same time or over a timeframe of 600 years. Some skulls show signs of overkill, and have injuries to the back of the head in an execution style. All of the skulls still have their mandibles, and the first 3, 4, 5 vertebrae have cut marks; evidence that the heads were cut off before decomposition occurred. A few of the skulls in the nests have been dated to about 6400 BC, with only one outlier in the large nest. The dates in the large nest suggest that it was either a single event or took place over 200 years. Also, the two nests appear to be of different ages. At least 30 more skulls have been dated, and this should get the date range down to about 30 years, though with the conditions of the skulls and the different ages of the two nests, the best date range scientifically achievable at the moment is more like 90 years, which is still definitely shorter than previously thought. Are these nests evidence of warfare among hunter-gatherers? In a more primitive society, if someone did you wrong you would kill the person you are angry at. However, once you start to target that person’s group and not them specifically for revenge, that is a feud or warfare between two groups of people. The killing of children shows this – it is unlikely that a young child killed someone or were the subject of sexual jealousy, so the fact that there are children’s skulls in the nest suggests that they were not targeted because they had done wrong, but because they were associated with the person who did, though this is very debatable. There are a couple of other sites where something similar has been observed like in Ofnet. In Mannlefelsa, there is a male skull with similar perimortem injuries, with cut marks present also. In Hohlenstein-Stadel there were three individuals found; a man, woman and child, all killed. The child’s skull showed it would have been about 6 years old, but it was larger than it should have been for a 6 year old, suggesting hydrocephaly. This condition would have affected the behaviour of the child, and once genetic testing has been done on these three skulls, it could be possible that the child was killed because of this condition, and its mother and father were also killed by association. Cis-Baikal is another site which Dr Schulting has worked on. There are about 1000 well preserved hunter-gatherers around the lake here from the early Neolithic to Bronze Age. There is no evidence of farming in this region even in the Bronze Age, and it is thought that the Bronze objects were brought here through trade or other means rather than being produced and manufactured in the area, though this is not clear. One unusual aspect of this site is that the mortuary complex for the middle Neolithic is missing. This is a complete mystery, as there is some evidence of settlement for this time period nearby, but no burial evidence until the late Neolithic. One cemetery called Shamanka II around Lake Baikal contains both single and multiple burials, with microliths as grave offerings, and some skulls showing perimortem damages. Thanks to a large amount of funding, every individual around the lake has been dated. So how did the Bronze Age hunter-gatherers know to bury their dead at this site? Too much time had gone by for oral folk tradition to have provided the information, so either coastal erosion around the site had exposed some Neolithic graves, or just decided that because of the striking view it was a good place for burials. There are two clusters of these burials – north and south. The south cluster contains four young adult males, while the north is much more varied with males, females and children. The south cluster all show signs of perimortem injuries, with projectile points or outlines of projectile points found with the skeletons. One of the skeletons in the north clusters is a young adult and contains 22+ arrowheads in the grave. These are unlikely to be grave goods as they are all pointing in different directions, so it is more likely to be evidence of overkill. One skull shows two sharp force traumas to the mandible, though no axes have been found in the area, so perhaps the perpetrators came from the outside and massacred these people in an act of war. These two clusters may have slightly different dates, with a range of 100-200 years – so perhaps this is evidence of two separate massacres? Statistically they could both be from the same group, though the fresh water reservoir effect must be taken into account, as these people would have eaten the fish from the lake which may skew the dates slightly. For a hunter-gatherer society, the amount of deaths present here are extremely high, and the closest ‘normal’ Bronze Age cemetery is about 100 km away, with no big Bronze Age settlement found nearby. The resources at the lake may have been enough motive for the massacre(s) at Cis-Baikal, but what was the motive for the massacre(s) at Ofnet? The nests in Ofnet were in a forest, where the resources would have been the same and enough for kilometres around. This means that the massacres may have been more complex than simply killing for resources, it may have been different generations getting revenge, or jealousies which spiralled out of control, or even a matter of prestige between different groups; the bigger a group the more powerful.